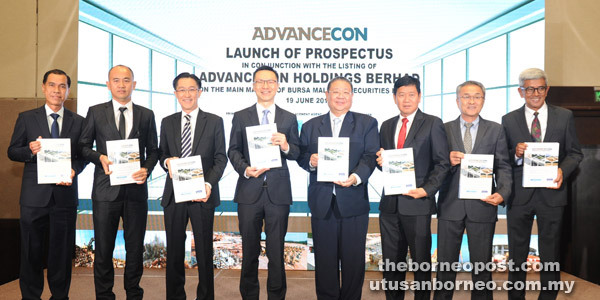 KUALA LUMPUR: Earthworks and civil engineering services specialist, Advancecon Holdings Bhd, slated for listing on the Main Market of Bursa Malaysia on July 10, expects to raise RM56.7 million from the initial public offering (IPO). The IPO would be used to support capital expenditure and working capital requirements for future growth, among others. Chairman Datuk Yeoh Chong Keat said 26 per cent of the proceeds or RM15.1 million would be allocated for the acquisition of new and higher capacity construction machinery and equipment, which would enhance the group’s operating capacity. “This will give us more flexibility and increase our efficiency in the coordination of machinery and equipment for all our construction projects, resulting in better time management and reducing overall operating cost,” he said at the launch of the company’s prospectus yesterday. Meanwhile, RM14.6 million would be used for the construction of a new workshop for in-house maintenance, modification and repairs of the group’s machinery fleet, RM10.7 million for working capital, RM12.5 million for the repayment of bank borrowings and RM3.8 million for listing expenses. The IPO entails a total offering of 90 million shares at an issue price of 63 sen per share, representing 22.4 per cent of the group’s enlarged share capital. The shares would be allocated for private placement to institutions and identified investors (37 million shares), private placement to identified Bumiputera investors (18 million shares), eligible directors and employees of the group (five million) and public balloting (30 million shares). During the press conference, Chief Operating Officer/ Executive Director Ir Yeo An Thai said the group’s order book stood at RM572.5 million as of May 19, 2017, which would sustain it until end-2019. He said from Jan 1 to May 19, 2017, the group had also tendered for projects worth RM496.4 million, which were mainly for national ventures. “We are optimistic of securing more jobs after the IPO. The recent contract wins to undertake earth and civil engineering works for the West Cost Expressway (WCE) worth RM239.8 million, and Pan Borneo Highway (RM105.2 million) would take 30 months. “We have also maintained our profit after tax double-digit growth (margin) from 10 to 12 per cent over the last three financial years,” he added.